I never smoke or drink but why did I get cancer?? WHAT IS THE REASON FOR CANCER ? This question, I am sure has been asked by millions, so I thought I will tell you how cancer occurs. ‘All the cells in the human system are programmed to die as soon as they are born’ . This phenomenon is called APOPTOSIS. That’s true of the whole organism, as we know. It is indeed interesting that as soon as the cell is formed, it has been assigned a specific function, period of growth and finally the time of death. 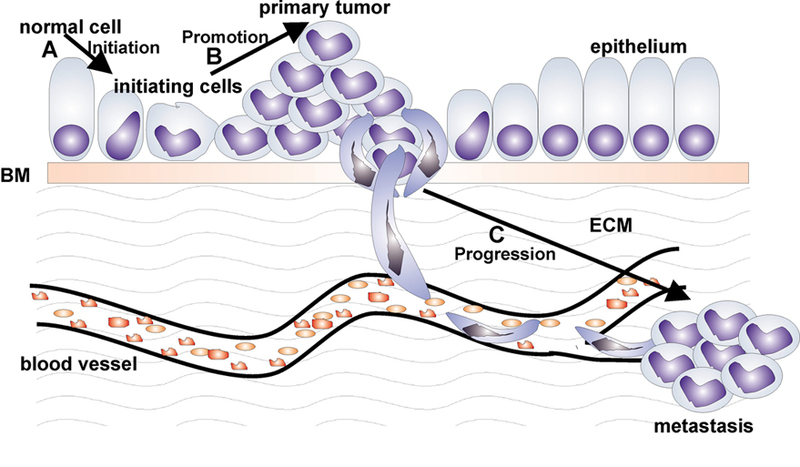 Cancer cells are like any other normal cells. The closest analogy, I can say, is that of a terrorist. Someone who is part of the Society or human system and looks like anyone else. But in a cell, instead of following a set pattern of growth and then death, some of the switches get ‘turned on’ and continues to divide and proliferate endlessly. It forms a ‘Tumour’ – a lump in Greek. There are very efficient defense mechanisms in the body to clear such abnormal cells but some of the cells do escape vigilance like how a terrorist escapes intelligence operations. After some time the tumor outgrows with support of supplements and nutrients and starts to undergo necrosis or death. The cells start becoming smarter and start to acquire nutrients by a process called Angiogenesis. The research on Angiogenesis has won Judah Folkman a Nobel prize. Once new blood cells start multiplying there is no limit to the growth of rogue cells. By another process they gets detached from the tumour and come into the blood stream and gets implanted in different areas – liver, lungs, bones and again start to form nests of cells. In this whole process, the body undergoes starvation as the tumor gets nutrition in preference to the normal cells and weight loss and other manifestations of cancer appear. This is a slow multistep process and cells do not divide in hours as is commonly believed. In fact in colon cancer the doubling time is in months. Now, what triggers such a change. While we know that there are other factors like tobacco, there are many unknown factors. Many times in such cells dividing genes can be damaged. Mutation can happen which will trigger activation of switches for Oncogenes. It is a random unfortunate event. I can tell you that while the mutations are being identified which lead to cancer, there is no real way to predict when and what cell can undergo mutation. Till then our best hope is ‘Early Diagnosis and Effective Treatment’, both of which are available today. I can only tell Rajan that it is just unfortunate that the young man has a tumour and give him all courage to fight the disease.